If you've ever eaten a chocolate bar, it's safe to say you've probably eaten one of the ones on the list below. The biggest chocolate manufacturers are some of the oldest companies operating today, for the simple reason that sweet treats never really go out of fashion. But the age and familiarity of these confections mean that few of us ever sit down and wonder just where they got their names. We accept that we call a Kit Kat a Kit Kat because our parents and grandparents did the same. But at some point, someone had to name these brands. So what were they thinking when they did? First produced in 1935 as Rowntree's Chocolate Crisp, the Kit Kat received its modern name in 1937 when it began to be marketed as the Kit Kat Chocolate Crisp. Frustratingly, no one can confirm where its name came from, though it's widely believed to be a reference to the famous Kit Cat Club, a 1920s jazz nightclub in London's West End which was, for a long time, one of the city's most popular venues. The nightclub was itself named after the Kit-Cat Club, a political society formed in the early 1700s and named for the man who owned the tavern where meetings were held—one Christopher Catling, a.k.a. Kit Cat. All of which gives the Kit Kat a pretty impressive lineage. First sold in 1908, the Toblerone is a combination of milk chocolate, nougat, almonds, and honey shaped to resemble the Matterhorn mountain or, depending on which version of the story you believe, a pyramid of dancers from a show at the Folies Bergères cabaret hall. The largely meaningless name makes a little more sense when you realize that it was manufactured by Swiss chocolatier Theodor Tobler. Its full name is a portmanteau of Tobler's surname and the Italian dessert torrone, which is a type of nougat containing honey, sugar, and nuts that forms the inspiration for the bar itself. Introduced in 1923, the Milky Way was both inspired by and named after a popular malted shake of the era. The intention was that the bar—the first-ever filled chocolate bar—would replicate the flavors and experience of drinking the similarly-named milkshake. Introduced in 1930, the Snickers bar was Mars's follow-up to the Milky Way. Franklin Mars named the confection after his wife's favorite racehorse; unfortunately, the horse died two months before the product came to market. For most chocolate bars, there's some clue to where the name came from—and if there isn't, you can normally work it out. But the Twix name is shrouded in mystery in much the same way its bars are shrouded in chocolate. 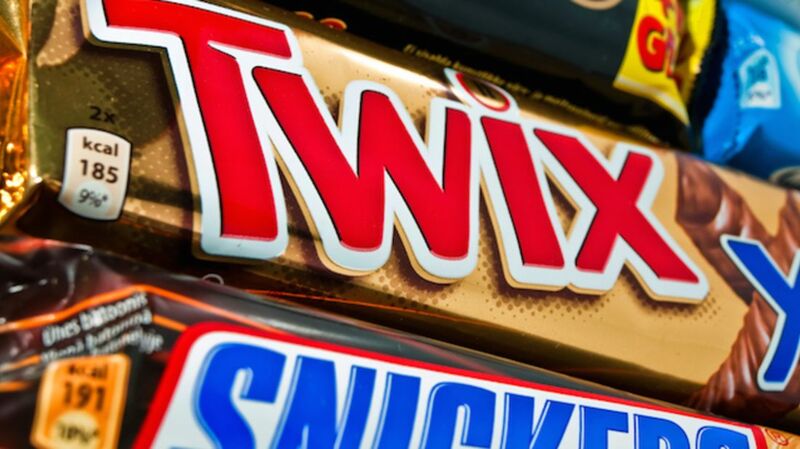 The product originated in the UK in 1967, and early ad campaigns in Britain and the U.S. emphasized the word "mix," so it might be that Twix is a portmanteau of "twin" and "mix" or "twin" and "stix," referring to its pair of bars and mixture of ingredients.